The Balkars, an ethnic group in Russia’s North Caucasus, survived vicious purges and deportations under Stalin. They are now seeking all means to recover from that setback in their development and are anxious to make up for lost time. The Kabardino-Balkaria region in Russia’s North Caucasus has around 100 small villages today inhabited only by the Balkar people, one of the region’s two native ethnic groups. Most of them can be found in the Chegemsky, Chereksky and Elbrussky districts, and also in Upper Balkaria. The villages are often more mixed in other places closer to the plains – both Balkars and Kabardians live there. Plain houses stand side by side with ancient structures in every Balkar village, with busy tourist spots located nearby. 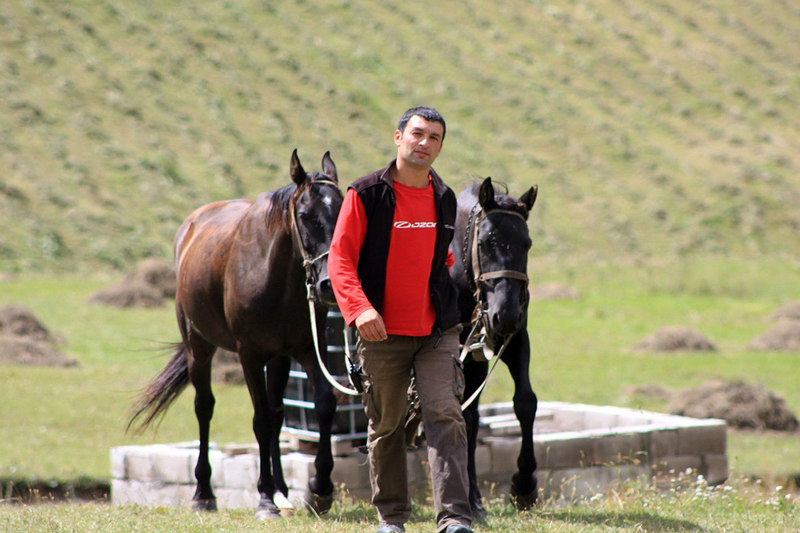 The Balkars, a Turkic people who adhere to the Sunni branch of Islam, typically engage in traditional cattle breeding and trade at bustling tourist markets, where they sell woollen garments and souvenirs and run cafes offering traditional cuisine. "The Balkars are almost all relatives – across several generations," said Marat Mushkayev, a local resident and entrepreneur. "There is probably no person in the village of Eltyubyu who isn’t a relative of mine. It happens that distant relatives get married in small villages. But now, young people often go to towns – Nalchik or Chegem. And they often marry Kabardian women there,” he said. Large towns and villages are ethnically mixed. Nalchik, the capital of the New Kabardino-Balkaria Republic, has more Kabardians. While the Balkars are traditionally engaged in handicrafts and agriculture, the Kabardians have more entrepreneurs, office workers and civil servants. "The deportation strongly affected development of the Balkar people," said Indira Guzeyeva, an urban Balkar woman, who was born in Nalchik and now works in PR and marketing. "In 1944, during World War II, our people were banished to Kazakhstan and Kyrgyzstan on false charges of aiding the German Nazis. We were not welcome there – we were seen as murderers and traitors. In a foreign land, the people worked hard, and the children did not go to school. Overall, that deportation pushed our people's socio-economic development back by several decades," said Guzeyeva. The Balkars' exile lasted 13 years: In 1957, as the backlash against Stalin grew, the repression was declared erroneous and illegal, and the Balkar people were allowed to return home. "What’s the difference between the Balkars and the neighbouring Caucasian ethnicities? They are the most settled," said Indira Guzeyeva. "They don’t like to leave the republic; they’ve got used to sticking close to the mountains. When my father had money, he bought a house on the mountain in Nalchik, the republic's capital, although financially he could afford an apartment in the centre or a house in a new neighbourhood." Guzeyeva claimed the Balkars are more honest, so it is believed that this ethnicity does not have a commercial vein, of which their enterprising neighbours, the Kabardians, can boast. "Our grandparents could not learn because of the repression, our parents because of the need to restore households after the return, but for the next generation, higher education is prestigious," said Guzeyeva. Even those rural Balkars who understand that they will not have much use for knowledge often go to city universities to get degrees. They choose popular specialities like economics and law, although fierce student enrolment competition for these courses are a thing of the past in many Russian universities. The traditional way of life for them, however, still remains the same: Every Balkar is able to make cheese, feed the sheep and work at haymaking. They are also able to knit shawls and socks – regardless of gender and social status. Children are brought up strictly – fathers can take girls to study until high school. Urban girls, of course, can wear modern clothes, but those in the village most often wear headscarves. Children are encouraged by families to work at an early age. "I was taught to knit when I was six and, every day before leaving for school, I was knitting woollen scarves, sweaters and socks to sell," said Guzeyeva. "The standard output was nine items a day. And it is not only the domain of women – my brother was knitting, too! In the 1980s, my parents, like many other Balkars, took woollen goods to sell in other regions and Ukraine. In the 1990s, however, this didn’t bring much money, and we stopped doing it." Russia is home to 112,900 Balkars, the vast majority of whom – 108,500 people – live in their historical homeland, in Kabardino-Balkaria. The rest took root in Kazakhstan during the repression. There is also a small diaspora of Balkars in Turkey – by different estimates, around 1,000 people. About the same number live in some European capitals. It is interesting to note that the Balkars who have moved away from the mountains always belong to the upper classes. They are called "mountain princes" – Taubii, and are representatives of ancient families mixed with the Kabardians. Most often, their last names are Misakov, Sharkhanov or Aidabulov. Only a few of them are left in the republic today.